Need remote control codes for your Kogan TV? 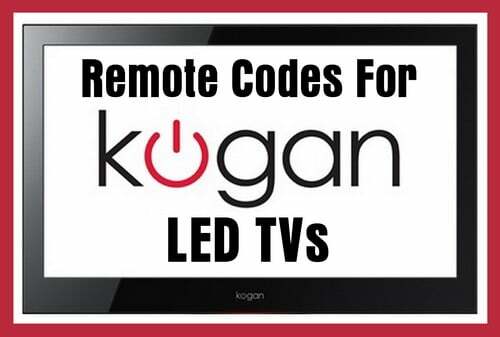 We have a list of all known and working remote codes that will work with Kogan TVs. The remote codes for Kogan are 4 digit remote codes. The remote codes will work with all universal remote controls. If you have any issues with the Kogan TV remote codes not working, feel free to ask a question below and we will be happy to help. Help with KOGAN TV remote controls and TV manuals. Have any questions about programming a universal remote to a Kogan TV or need another remote codes? Please leave your question below and we can assist you further. Does anybody have a remote code for Kogan KALED65XU9010SKA ? I have purchased a Universal Control & Run through with Auto Search & Have Manually used All the Code Numbers you have listed, But with no success. Kogan say they don’t have a code for this TV. Could you please advise if you Know of a Code for this TV unit? I have a Kogan KALCD55FHDA with no remote. I bought a one for all universal remote and there is no code in the manual to match with kogan tv. I tried some of these codes but no dice. Please advise if there is a specific code or if I need to buy a new remote (and which remote would I need)? Thanks. Kaled55xxxta the codes provided by Kogan do not work with my universal remote. Please advise code needed to program remote control. I have purchased a Oneforall URC 7120 universal remote and it will not “talk” to my Kogan TV 24″ KALED24XXXZC…original remote “died” when a battery corroded. The uni remote cannot find a code…anyone have any clues ??? Have just bought a Kogan TV and remote does not work. Model no. is KALED19DVDZC. I have a Prestige Philips universal remote trying to get it to work on a Kogan led 42 xxxwa. Can you please help me I’m so lost. I have just purchased a 42 inch Kogan TV and I am trying to set a kmart big universal remote control. I have all the codes but they don’t work. I am codes 7890 0418 0641 0714 0726 0754 0779 0816 1190 2267 1404 0037 0587 0371 0218. I have a non functioning remote (tested using digital camera method) for the Kogan branded KALCD22DVDAA television. I have seen numerous combination style remote controls offered on your website and the codes listed for these units however I am in the Philippines and I am not sure if locally sourced remotes would work with these codes. Is there a simple way of distinguishing which remotes would work with which televisions? Can you tell me what the remote code is for my Kogan tv model KULED19DVDYA . How do I program this please. I have a Samsung PVR with remote #AK59-00139A. How do I program this remote to control my new Kogan KALED55UHDUB tv? Iv’e tried all the codes in my new universal remote and none work. Could you please assist me with the following. Universal Code for 55″ Kogan Agora 4K Smart 3D LED TV (Ultra HD) KALED55UHDZC. What code for Kogan TV kaled6500000329 65 inch LED/LCD? I’m using an audio sonic universal remote (bought in Kmart) for a Kogan 22” FHD LCD TV. Unit no….KALCD22DVDAA. Its a TV / DVD combo in Australia. Can you give me more codes or advice as for how to programme a remote for this unit. Chunghop universal remote allows only 3 digits on KOGAN TV is there any way to do it? Will these codes work on a Kogan TV KULED22XXXYA?